An Giang (VNA) – Fourteen houses and two house floors in My Hoi Dong Commune, Cho Moi district, the Mekong Delta province of An Giang fell into the Hau River due to riverbank erosion on April 22. A road connecting My Hoi Dong commune and Nhon My commune was also damaged and isolated. The 70-metre long eroded section caused estimated total damages of 8.8 billion VND (391,000 USD). There have been no deaths. Truong Trung Lap, Chairman of Cho Moi district People’s Committee said that local forces have been mobilised round the clock to ensure traffic order and evacuate residents and their property out of the dangerous area. The A My Hoi Dong primary school announced it would close on April 24 -25. An alternative road to replace the damaged road is set to be built. The district will also provide land for the affected households to resettle down in a new residential area, Lap said. 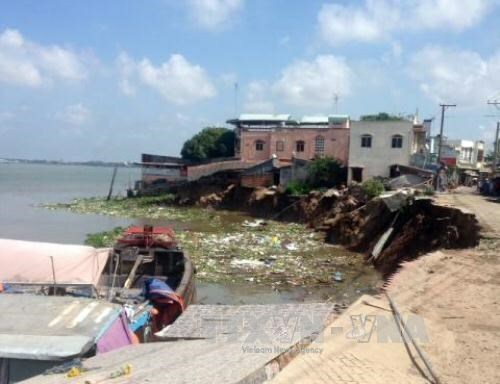 According to Lam Quang Thi, Vice Chairman of the provincial People’s Committee, local authorities allocated nearly 3 billion VND (133,300 USD) to the households whose houses were damages or at risk from riverbank erosion. Forty million VND (1,760 USD) was provided for each of the 16 households whose houses have been washed away, and 42 others that are highly vulnerable to land erosion were evacuated. Secretary of the provincial Party Committee Vo Thi Anh Xuan urged the provincial People’s Committee and Cho Moi district to relocate residents from risky area. The district People’s Committee will devises measures to ensure school continuity for local students. Chapters of the Vietnam Fatherland Front at all levels will work with local authorities to support affected people. The provincial Department of Agriculture and Rural Development is responsible for selecting consultants to propose measures to address the erosion. According to the provincial Department of Natural Resources and Environment, about 260m of river bank is at high risk of erosion.